Evolutionary events shaped the cat’s core metabolism such that their systems are uniquely set up to metabolize a diet which is high in moisture, high in protein, and very low in carbohydrates. Because this is the diet they have relied upon for tens of thousands of years, they do not have the ability to process carbohydrates very efficiently (1-4). This becomes extremely important when selecting a diet for cats with diabetes, as I’ll discuss below. So what are these specific feline adaptive mechanisms that have developed to meet the requirements of a carnivorous diet? First, cat’s gluconeogenic pathway provides an almost continuous source of carbon skeletons for glucose or energy production. Secondly, glucokinase concentrations are markedly reduced or absent, whereas hexokinase activity is increased. This is in marked contrast to the liver of omnivores (dogs, man), which contains both glycolytic enzymes that act to catalyze the phosphorylation of glucose during glycolysis. Finally, cats have reduced amylase and disaccarharide activity in the small intestine, reduced and delayed insulin secretion, and delayed gastric emptying (1-4). As a result of these differences, plasma glucose clearance rates are longer in cats compared to dogs or humans after feeding a moderate to high carbohydrate meal — in other words, even normal cats have much more prolonged postprandial period of hyperglycemia than might be expected. In healthy humans and dogs, postprandial hyperglycemia normally persists for 2 to 5 hours (5-6). In contrast, a recent study of healthy cats found that both serum glucose and insulin concentrations remained significantly increased for a median time of 12 hours following ingestion of a moderate carbohydrate meal (25% ME), and that both glucose and insulin concentrations remained above baseline values for 24 hours in approximately 20% of the cats (7). Most feline diets (especially dry foods) contain ever higher amounts of carbohydrate and therefore would be expected to result in more severe postprandial hyperglycemia and a longer time to return to baseline. 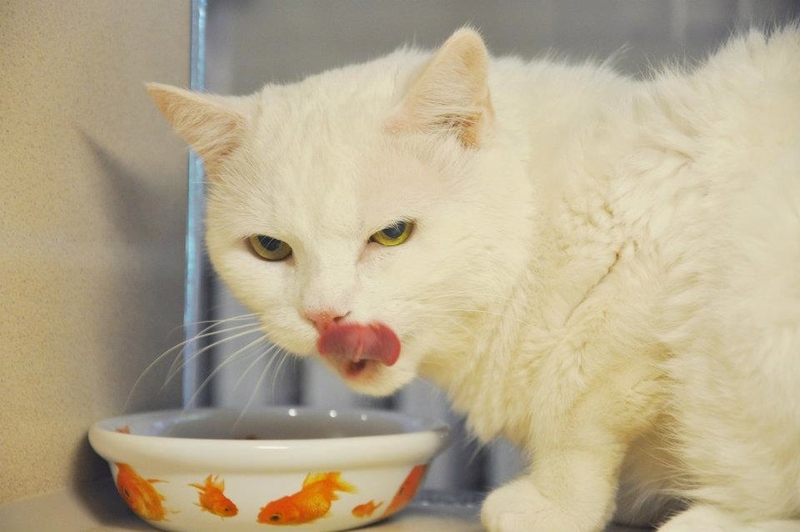 Dietary Management of Cats with Diabetes Mellitus: Key Part of Treatment! In cats with diabetes, a primary goal of therapy is to minimize the degree of hyperglycemia that develops after feeding in order to lessen the subsequent demand on beta-cells to secrete insulin. By doing this, we decrease the effect of “glucose toxicity” and allow the pancreatic islet cell to hopefully recover (8,9). But how do we do this? It has long been known and is a well accepted “dogma” by most practicing veterinarians who specialize in feline medicine that feeding a low-carbohydrate diet is the mainstay in the treatment of diabetes mellitus, especially if remission of the diabetic state is the goal. Feeding a low carbohydrate diet will improve insulin sensitivity, reduce or eliminate the need for exogenous insulin, and help stabilize glucose metabolism in these cats (9-12). Again, one major way a low-carb diet improves the diabetic state is by helping to prevent severe and prolonged postprandial hyperglycemia. The sooner one starts the diabetic cat on a low-carbohydrate diet, the better. By “low-carb,” I mean a diet that provides less than 10% of the calories as carbohydrate. Some cats will do fine on a slightly higher-carb diet (12-14%) whereas others do best on a diet containing less than 7% carbohydrate. To achieve these low carbohydrate levels, we must formulate a homemade diet or feed a canned food. I'd recommend that one go to Dr. Lisa Pierson's website at www.catinfo.org. Once there, you should review the “Protein/Fat/Carbs Chart” on the sidebar of the homepage to select an appropriate low-carb diet. None of the available dry cat foods are very low in carbohydrates and most are too low in protein. It’s best to limit the amount of dry food that is fed to diabetic cats, or even better, not feed dry food at all. When we reduce the content of carb in a cat food, we must raise the content of either protein or fat, or both. I like to do both, feeding my diabetic cats a diet that mimics the composition of their prey in the wild: about 40-60% of protein with the remaining amount in fat. This higher than average protein level also helps restore and maintain lost muscle mass, since many diabetic cats will develop muscle wasting or “sarcopenia” as they age (13-17). Another plus for feeding low-carb, hi-protein diets in cats with relatively early diabetes is that this diet composition (together with insulin treatment) greatly improves the diabetic remission rate (18-20). If the diabetic cat goes into remission (no more insulin needed to maintain euglycemia), we recommend maintaining a restricted carbohydrate diet for life to help prevent relapse of the diabetic state. Zoran DL. The unique nutritional needs of the cat In: Ettinger SJ,Feldman EC, eds. Textbook of Veterinary Internal Medicine. 7th ed: Saunders Elsevier, 2010;652-659. Verbrugghe A, Hesta M, Daminet S, et al. Nutritional modulation of insulin resistance in the true carnivorous cat: a review. Crit Rev Food Sci Nutr 2012;52:172-182. American Diabetes Association. Postprandial blood glucose. Diabetes Care 2001;24:775-778. Elliott KF, Rand JS, Fleeman LM, et al. A diet lower indigestible carbohydrate results in lower postprandial glucose concentrationscompared with a traditional canine diabetes diet and an adult maintenance dietin healthy dogs. Res Vet Sci 2012;93:288-295. Farrow H, Rand JS, Morton JM, et al. Postprandial glycemia in cats fed a moderate carbohydrate meal persists for a median of 12 hours — female cats have higher peak glucose concentrations. J Feline Med Surg 2012; 14:706-715. Zini E, Osto M, Franchini M, et al. Hyperglycaemia but not hyperlipidaemia causes beta cell dysfunction and beta cell loss in the domestic cat. Diabetologia 2009;52:336-346. Rucinsky R, Cook A, Haley S, et al. AAHA diabetes management guidelines for dogs and cats. Journal of the American Animal Hospital Association 2010;46:215-224. Bennett N, Greco DS, Peterson ME, et al. Comparison of a low carbohydrate-low fiber diet and a moderate carbohydrate-high fiber diet in the management of feline diabetes mellitus. J Feline Med Surg 2006;8:73-84. Mazzaferro EM, Greco DS, Turner AS, et al. Treatment of feline diabetes mellitus using an alpha-glucosidase inhibitor and a low-carbohydrate diet. J Feline Med Surg 2003;5:183-189. Perez-Camargo G: Cat nutrition: What is new in the old? Compendium for Continuing Education for the Practicing Veterinarian 2004;26 (Suppl 2A):5-10. Wakshlag JJ. Dietary protein consumption in the healthy aging companion animal. Proceedings of the Nestlé Purina Companion Animal Nutrition Summit: Focus on Gerontology. St. Louis, MO. 2010, pp. 32-39. Boari A, Aste G, Rocconi F, et al. Glargine insulin andhigh-protein-low-carbohydrate diet in cats with diabetes mellitus. Vet Res Commun 2008;32 Suppl 1:S243-245. Roomp K, Rand J. Evaluation of detemir in diabetic catsmanaged with a protocol for intensive blood glucose control. J Feline Med Surg 2012;14:566-572. Reusch CE, Hafner M, Tschuor F, et al. Diabetes remission incats: a review. Schweiz Arch Tierheilkd 2011;153:495-500. Why not feed low-carb/high protein and fat diets from the beginning of a cat's life since they are obligate carnivores? I have a male cat who was becoming overweight, so I did some research and put him on a high protein diet and he is back to a healthy weight in a matter of a few months. I got this insight from watching my husband lose almost 100 pounds on a low carb diet after he had become pre-diabetic. We have discussed at length how some people should probably be on low carb diets from youth. Low carb didn't work for me. The trick would be determining early on who requires a low carb diet for health. With cats, it seems like if they are obligate carnivores, low carb should be the permanent way to go. I completely agree with you. Cats in the wild get less than 2-3% of their daily calories from carbohydrates. And this is how these cats eat every day of their lives, so there is no reason to start cats on a low-carb diet only when they become diabetic. But I do also agree that individual cats, like people, can handle carbs quite differently. I personally don't do well when I ingest carbs and try to limit my intake, whereas other people do fine eating large amounts of carbohydrates. The same appears to be true for cats as well. But what is true, as you point out, is that cats are obligate carnivores and no cat requires carbs to survive or thrive. I agree with everything you have said in this "insight". Satiation in a cat occurs with less then 5% carbs, but 2% carbs or less is ideal. Cats fed a diet low in carbs are satiated and do not tend to beg for feeding for about 10 hours. There is a famine(s) gene that makes it even more important to recognize and deal with an obesity prone cat early in a it's life. There maybe a relative application of the famine gene(s) activation from early kittenhood and raw genetics. Starvation is a powerful initiator of these genes. cats are survivors. Shed light on the darkness.